Ah, Blossom, I'm so glad you stopped in. I hope you continue to present screencaps for these scenes yourself. 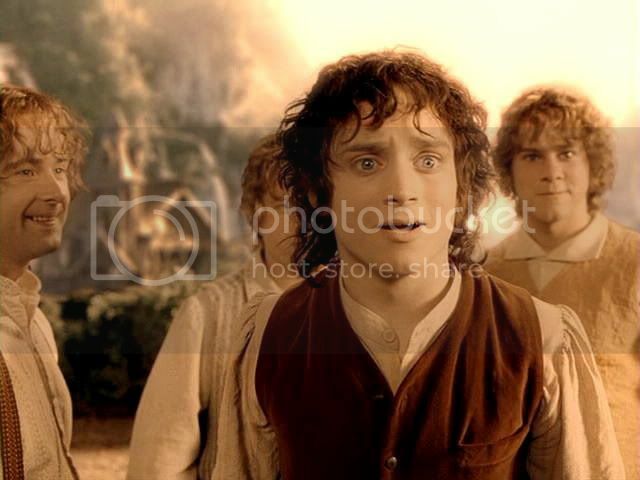 You haven't done a slideshow set for CoE, I don't think, or Bilbo giving Frodo Sting and the mithril shirt (although you must have made a few caps, since these moments appear now and then in the music videos). Your caps are so unique (and big! ), like individual art works. I want more! "For another beautiful treatment of the early Frodo - Bilbo scenes, made from the widescreen edition, go to Blossom's In Dreams site [give link]. Look up the slideshow titled "My Dear Boy". There are two lovely animated displays of the caps featuring music and snippets of dialogue, or open the gallery for extra screencaps." I mean, just look at the difference! Yours are not only richer than mine, the widescreen format shows more of the gorgeous setting (and other characters). I'm not throwing mine out, of course, because they make nice portraits, but Oh la la! for Blossom's screencaps!